In this tutorial I’ll walk you through how you can set up group tracks within group tracks. This is a very powerful technique for mixing your track. This is actually one of the techniques revealed by Skope in our forthcoming course ‘Bass, Beats and Mixdown Techniques’, coming out in June. Skope is one of the most prominent producers of the neurohop sound (he also makes dubstep, drum and bass and a lot of other styles of music). 1. 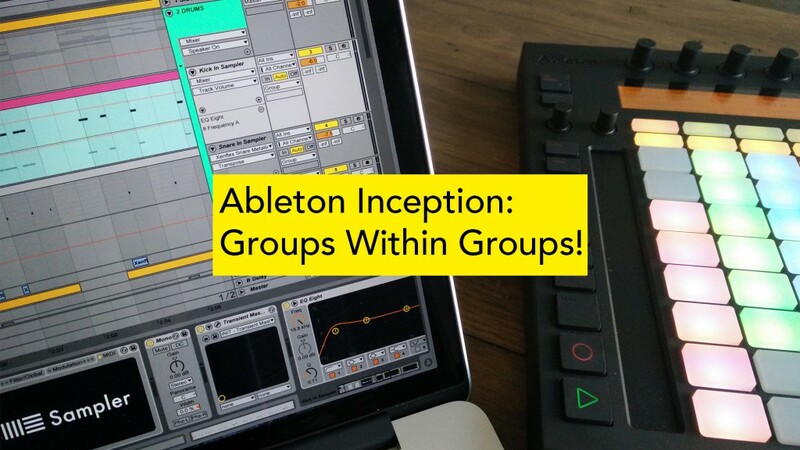 Let’s say that you have a group track that has various individual tracks in it – for example, a drums group, which has a kick track, a snare track, a hi hats track and a ride cymbal track. You can process each of these tracks independently of each other, giving you more control, but what if you want to process some of them together in the same way before sending them into the main group to be processed? 2. Insert a new audio track into your drums group. We’ll use this one for both our kick and our snare, so let’s rename it to ‘kick snare’. 3. You’ll see that all of the tracks have an ‘audio to’ and an ‘audio from’ chooser. We will now change some of the routing in these tracks. This new audio track is going to receive the audio from our kick track and our snare track, so that we can process them together, helping them to gel together better and sound more uniform, like they are being played by the same drummer and are part of the same drum kit. In the kick track, change the ‘audio to’ from ‘group’ to our new ‘kick snare’ audio track. 4. 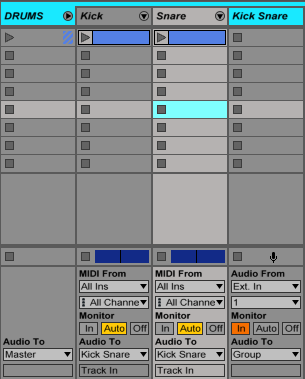 In the audio track, change monitoring from ‘auto’ to ‘in’, so that it receives audio from the kick and the snare tracks, and sends it to the group track. The image below shows the routing for these tracks. 5. You can now process the ‘kick snare’ track. You might want to add some compression to this track, so that the kick and the snare are both being compressed in the same way by one compressor before their audio is received by the drums group. This will help to make them sound more uniform and gel together, even if they were chosen from different sample packs. You can apply this technique to other sounds, like basses, melodic instruments and much more. In the video above I also do it with all of the other drum elements (hats, ride, break) and process the ‘hats ride break’ group track with one sidechain compressor, which is making these three tracks duck whenever a kick triggers it. This method saves a lot of CPU and works pretty nicely to give you much more control over the mix as a whole. Thanks to Skope for sharing this technique, one of many in his upcoming course. If this tutorial was useful, you may want to sign up to get 4 free customized tutorials on mixing and mastering your music. Alternatively, you may want to check out our mixing and mastering courses. 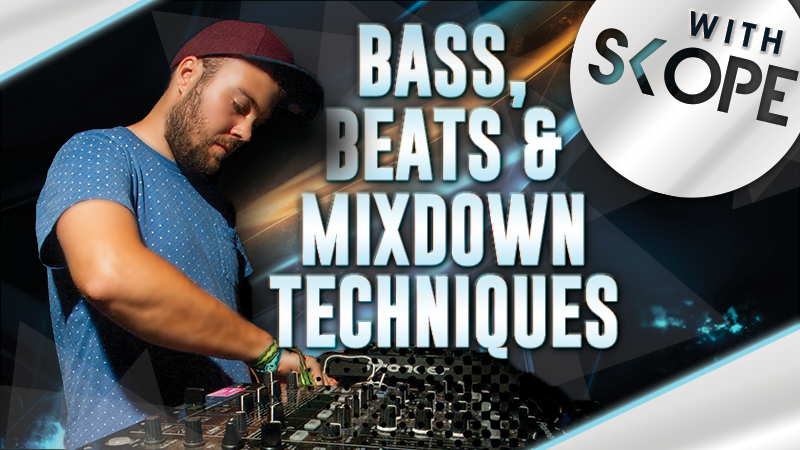 5 Reasons You’ll Love Our Dubstep Course Take Part In Our BassGorilla Remix Contest!